Take a look at this photo...These Marines are gathering together one week after two of their brothers fired on a VBIED which then detonated and killed them. The two Marines, Lance Cpl. Jordan Haerter and Cpl. Jonathan T. Yale, saved their brothers lives by giving their own. CAMP RAMADI, Iraq - The Marines with 3rd Platoon, Police Transition Team 3, Weapons Company, 1st Battalion, 9th Marine Regiment, come together April 29 to prove their resolve and to show support for one another. Cpl. 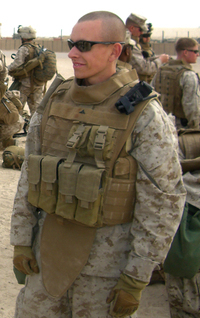 Jonathan T. Yale, a rifleman with 2nd Battalion, 8th Marine Regiment and Lance Cpl. Jordan Haerter were killed in action April 22 by a suicide bomber inside a dump truck with approximately 1,000 pounds of high explosives. "I was on post the morning off the attack," said Lance Cpl. Benjamin Tupaj, a rifleman with 3rd Platoon, Police Transition Team 3, Weapons Company, 1st Battalion, 9th Marines, with a hurtful tone in his voice. "I heard the (M-249 Squad Automatic Weapon) go off at a cyclic rate and then the detonation along with a flash. It blew me at least 3 meters from where I was standing. Then I heard a Marine start yelling 'we got hit, we got hit.' It was hectic." (Photo/ LCpl. Casey Jones). RAMADI, Iraq – It was a typical quiet morning on April 22, with the temperature intensifying as a bright orange sun emerged high from the horizon. However, this morning would be different. Quickly it would turn chaotic, then tragic. Two Marines would gallantly sacrifice their lives so others could live. Lance Cpl. Jordan Haerter, a rifleman with 1st Battalion, 9th Marine Regiment, Regimental Combat Team 1, and Cpl. Jonathan T. Yale, a rifleman with 2nd Battalion, 8th Marine Regiment, RCT-1, were standing post, just as they’ve done numerous times before. It was during a standard length watch at a small checkpoint protected by concrete barriers where they overlooked a small gravel road lined with palm trees leading to their entry control point. A truck packed with thousands of pounds of explosives entered the area where Haerter and Yale were standing guard. Realizing the vehicles intentions Haerter and Yale, without hesitation, stood their ground, drew their weapons and fired at the vehicle. The truck rolled to a stop and exploded, killing the two Marines. In the face of a committed enemy, Haerter and Yale stood their ground, in turn saving the lives of numerous Marines, Sailors, Iraqi policemen, and civilians. Both Marines displayed heroic, self-sacrificing actions and truly lived up to the Corps' values of honor, courage, and commitment. A week after the attack, the Marines with 3rd platoon, remember their fallen brethren as good friends and Marines. “Cpl. Yale was a great guy, really friendly and kind of shy,” said Hospitalman Eric Schwartz, a corpsman with the platoon. Lance Cpl. Jordan Haerter was killed in action April 22 by a suicide bomber inside a dump truck with approximately 1,000 pounds of high explosives. Haerter battled a hostile challenger, in turn saving the lives of countless Marines, sailors, Iraqi policemen, and civilians. He displayed heroic, self-sacrificing actions and truly lived up to the phrase honor, courage, and commitment while putting his own life in harm's way. “Haerter was an amazing guy. 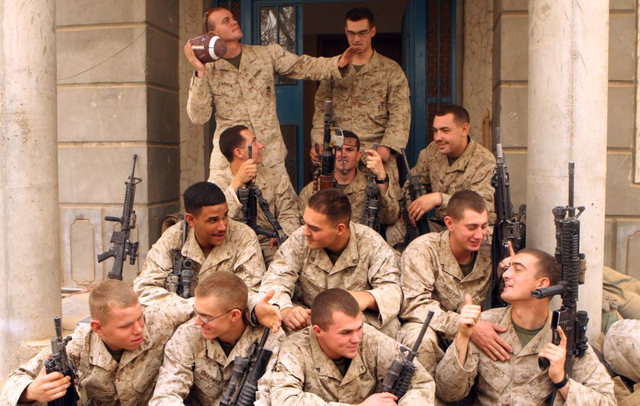 I knew everything about him; he was my best friend,” said Lance Cpl. Cody Israel, a rifleman with 3rd platoon and Haerter’s roommate for more than a year and half. Haerter and Yale were both posthumously awarded the Purple Heart Medal, Combat Action Ribbon and have been nominated for an award for their valor. Godspeed Lance Cpl. Jordan Haerter and Cpl. Jonathan T. Yale.